The most New York-centric of filmmakers for the first forty years of his career, in the last decade Woody Allen has discovered the rest of the world. At least, he’s discovered Europe. In recent years he has made films set in London (Match Point), Barcelona (Vicky Christina Barcelona) and Paris (Midnight in Paris). 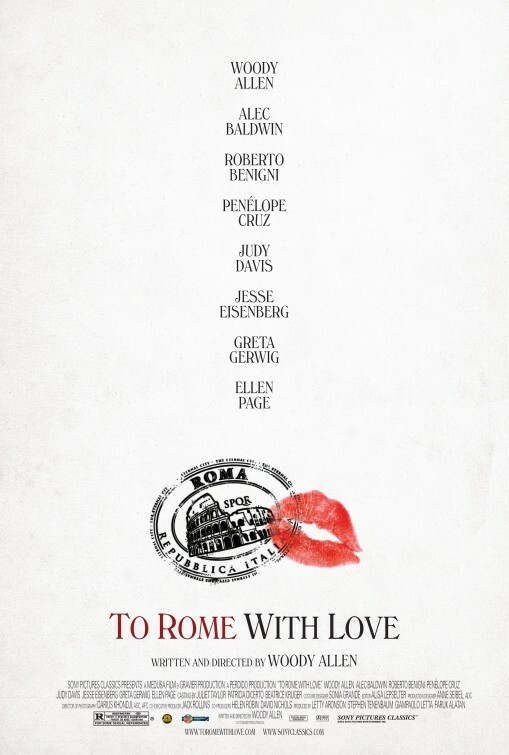 And now, with To Rome with Love, we get Woody Allen’s ode to the Eternal City. Midnight in Paris was a great success, it was far and away Allen’s biggest box office earner, it earned an Oscar nomination for Best Picture, and it introduced a whole new audience to Woody Allen’s filmmaking. It also put a great deal of expectation on his next film, which at a glance looked like it followed the same formula. As it turns out, To Rome with Love is a much more typical Woody Allen film, and unfortunately it fails to reach the heights of his previous effort. The film consists of four separate but interwoven storylines, with varying degrees of absurdity. There is the record producer who discovers an amazing opera singer who can only sing in the shower; the ordinary man who, for no apparent reason, becomes incredibly famous overnight; the man who is forced to spend the day pretending that the prostitute who came into his hotel room by accident is actually his wife; and the young man who is falling for his girlfriend’s best friend while his spirit guide, an older version of himself that he meets in the street, tries to convince him it is a bad idea. This format of separate story threads is reasonably common now, but in the better executions of it we expect the threads to connect somehow, either through their narratives becoming intertwined or through some thematic consistency. But that doesn’t happen here. The only connection is that they are all taking place in Rome. All four storylines are based on funny little ideas, but none of them really has the substance to become a full story in its own right, though some do better than others. Because Allen doesn’t seem to know where to take them, the movie really loses its way and fizzles out towards the end. A filmmaker who makes as many films as Woody Allen does – roughly one a year for almost fifty years – is going to be a bit hit and miss, and this is one of the misses. But despite all that, what really carries this film is the city of Rome itself. Allen has a tourist’s eye for the city and as such it never becomes just another city, just another location. It is always Rome, the Eternal City. So when storylines start to wear thin, or when jokes fall a bit flat (as happens more than a couple of times), Rome, in all its beauty, is still engrossing.